A New Vision for Sea World at 50! Concerned San Diegans will display a message for A New Vision for SeaWorld on its 50th Anniversary, outside the location where it was founded. March 21, 2014, is the 50th Anniversary of SeaWorld, which started right here in San Diego. San Diegans concerned for the safety and welfare of the captive orcas and their human trainers will once more demonstrate outside the entrance to SeaWorld San Diego. This Demonstration will be different in showcasing a new vision for Sea World in the 21st Century, based upon Dr. Naomi Rose’s proposal for seaside sanctuaries to which captive marine animal performers can retire and as recently proposed in AB 2140, the Orca Welfare and Safety Act. “We envision SeaWorld as it should always have been – providing real education in an eco-conscious environment.” – Jane Cartmill, President of San Diego Animal Advocates. With the recent introduction of AB 2140 by Assemblymember Richard Bloom, people who have been concerned for the safety and welfare of captive orcas and their human trainers have a concrete legislative proposal to advocate. AB 2140 is designed to: end the use of performing orcas in theme shows, ban captive breeding and prohibit the import and export of the so-called “killer” whales in California. Currently, SeaWorld San Diego is the only place in California where orcas are kept captive, with 10 currently held: Corky (wild caught in Canada,1970), Kasatka (wild caught in Iceland, 1979), Ulises (wild caught in Iceland, 1980), and captive-born Orkid, Keet, Shouka, Nakai, Ikaika, Kalia and Makani. 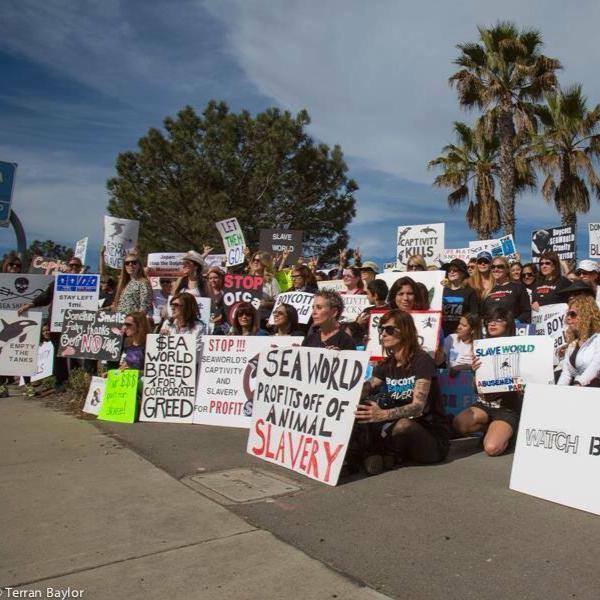 San Diego’s Mayor and City Council should be concerned about a continuing decline in visitors to SeaWorld here in San Diego if SeaWorld continues to ignore the growing movement for humane animal treatment worldwide. San Diego IS a world class tourist destination, and we need to embrace this movement to maintain this stature. Financial success need not be predicated on the captivity of highly intelligent, socially sophisticated marine mammals in wholly unnatural conditions. As recently reported by the Voice of San Diego, Disney’s two theme parks in Anaheim and Universal Studios’ park in Hollywood each draw more visitors and revenue than any of SeaWorld Entertainment’s parks. Captive orcas are forced to live in 1/1000th of the space in their natural habitat, forced to perform tricks on command for food with loud music blaring, exposed nightly to loud fireworks, placed in tanks with other orcas not from their natural pod creating conflict and physical harm and also isolated because of these unnatural social groupings, and bred artificially. SeaWorld Entertainment’s need for genetic diversity in its stock leads it to seek out wild-caught orcas, such as Morgan, a young, weakened female orca rescued offshore the Netherlands which SeaWorld Entertainment petitioned to have transferred to its partner park, Loro Parque in the Canary Islands (Spain), where six of SeaWorld’s orcas are on paid loan. The original permit to capture Morgan was predicated on her rehabilitation and return to the wild. SeaWorld Entertainment could use the incredible digital technology available today to simulate the REAL Sea World, just as more and more worldwide corporations are using digital and other advanced technology to eliminate the need to use live animals for testing drugs and consumer products. If you would like to join us to hold the signs and banner to communicate our New Vision for SeaWorld at 50 tomorrow (Friday 3/21) between Noon-3p, please email me at marthasullivan@mac.com or phone me at 858/945-6273. If you are coming out to join us, please plan to wear black clothes, comfortable shoes, sunscreen and a hat if you wear them. Please eat before you come out, and bring a reusable water/drink bottle in honor of the ocean. Thank You, OB Rag for publishing this! Thank you for doing this! Hope it went well! San Diego needs a new vision as well. I left a comfortable east coast job where I had developed a cyber security center in a large consulting firm almost 30 years ago. I moved to San Diego to work on a similar project. These are the kinds of jobs to build San Diego. Nobody will move here for a low paid tourist job at Sea World or anywhere else but this industry seems to run San Diego like a feudal fiefdom for the moneyed interests. I have no doubt that all or almost all the City Council and Mayor failed to watch Blackfish or listen to our animal rights arguments we have made over and over again. A phone call from Sea World to the Mayor’s office did the job of deciding for them. Instead of kow towing to tourism, San Diego should look to attracting those who would work in the kind of jobs that will build the city not minimum wage tourism jobs. An interviewee on KPBS today noted that cyber security can provide 1.5 billion dollars to the local economy, if they can get the workers. That will only happen if local pols raise up their heads from the usual obeisance to the tourism industry. It can happen where we have a great university and a very good one that aspires to greatness. That must include considering what makes a city great and that’s not done by a reflexive and unwarranted honoring of Sea World to protect a relatively paltry 19 million dollars in taxes. That’s the kind of thinking that will keep this place a provincial burg. Agree 100%, it’s not about min. wage jobs. It’s really about the conglomerate of Seaworld and its parent company- Blackstone group- whose CEO is worth 10B. They could care less about jobs paying min. wage. They care about their shareholders. I hope San Diego citizens see the truth- it will impact all the other aqua prisons in the country. Thanks for your comment. What a great comment! SeaWorld has heavily relied on scare tactics to manipulate the citizens and politicians of San Diego into a state of fear and panic concerning ab2140 citing tremendous job loss and economic upheaval. AB 2140, the California Orca Welfare andSafety Act, introduced by State Assembly Member Richard Bloom on March 7, 2104 will have to go through several committee’s before reaching Governor Brown’s desk for final approval. No date has yet been set for the first hearing, but we are hearing it could be as soon as sometime in early April. If you are a citizen of California who supports banning orca captivity, ending captive breeding and agree that Sea World should release their orcas that would not otherwise survive in the wild to seaside sanctuaries, NOW is the time show your support. Please CALL and/or WRITE to Assembly members on the ‘Water, Parks and Wildlife’ Committee voicing your support. AB-2140 must be approved by this committee FIRST in order for to move it forward. A simple “I support AB 2140′ will suffice but do feel free to write at length if you have more to say. Done! So important for all Californians to do! Imagine the draw SeaWorld could achieve – taking space utilized for human entertainment to providing the same space for the marine animals. Case in point… Take a satellite image of SeaWorld and find the theatre that was used for the “Cirque du Soleil – Cirque de la Mer” show – directly on Mission Bay. Compare the size of this theatre against the area encompassing all the orca pools. It may surprise you that a theatre designed for human entertainers have more space than orca whales. Believe this is where we start! Because of the limited space in existing pools – they need to separate whales periodically for their own safety – the whales do not enjoy confinement and act out and when they cannot get away – they suffer. Of could this could be debated – but SW has stated this reasoning themselves. Would suggest if SeaWorld wishes to gain visitors – it should change it’s model into true research and protection of the species. Instead of the shows – which clearly only demonstrate human dominance over animals – into making a connection with these animals in a more true habitat (ocean environment). It may be very well true that some of these beings may not be releasable, and also may have made human connections that may need to continue. Here is my broad stroke… Increase the size of SeaWorld by taking over the SeaWorld marina. Build a seawall to encompass this space and separate it from Mission Bay. We still have a degree of pollution to contend with – but ocean water could be reintroduced. This space would essentially be their new home – at maybe 10 times the space they have today. Human interactions could still occur through viewing windows. Ending the shows is absolute – if we are to consider the whole premise is conservation! The amount of people visiting this new space will dramatically increase and bring in true research. Build parking structures and utilize more of the land for more educational interactive exhibits – conservation goal means education! Construction jobs would skyrocket – SeaWorld sales would increase. International tourism would jump dramatically – as being the one place in the world where cetaceans are really treated properly. Increasing the space for marine mammals – would also make it possible to support larger rehabilitation – another draw for researchers! will wise up & stop looking for a camera for photo ops ! I was sick of him B 4 he even was on council, ugh. Sick daily now. He needs to go back from where he came & quit smoooozin for a camera lens. Im with u today with all my heart, all the way from minnesota. Thank so very much for your coverage regarding captivity of orca whales & AB 2140. We are truly grateful. Thank you so very much for your coverage regarding captive orca whales & AB 2140. We are truly grateful. Nobody questions any of the good work SeaWorld has done to help rescue, rehabilitate and hopefully return injured and sick marine wildlife to the wild. THIS is what it SHOULD DO, it’s a no-brainer. What IS questioned is SeaWorld’s stubborn refusal to recognize the growing movement for more humane and ethical treatment of animals by corporations worldwide — such as cruelty-free cosmetics, toiletries and household products and not using animals for biomedical research where advancing technology provides other means. With digital technology, SeaWorld doesn’t need to keep highly intelligent, socially sophisticated orcas captive in cement tanks, performing tricks for food and being bred artificially. SeaWorld could provide an amazingly rich and vibrant experience of the oceans to its customers via digital technology — ala simulation rides with sights, sounds and movement — MUCH more real and thrilling than the perversion of nature its circus shows represent.